“Which are you?” the mother asked her daughter. “When adversity knocks on your door, how do you respond? 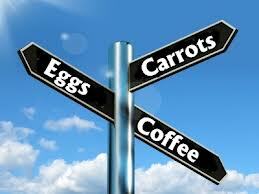 Are you a carrot, an egg, or a coffee bean?” Think of this: Which am I? Am I the carrot that seems strong but, with pain and adversity, do I wilt and become soft and lose my strength? Am I the egg that starts with a malleable heart, but changes with the heat? Did I have a fluid spirit but, after a death, a breakup, or a financial hardship, does my shell look the same, but on the inside am I bitter and tough with a stiff spirit and a hardened heart? Or am I like the coffee bean? The bean actually changes the hot water, the very circumstance that brings the pain. When the water gets hot, it releases the fragrance and flavour.